Steven Jenkins has a knack for creating non-fiction books that appeal to readers. His fantastic and elaborate torn- and cut-paper collage illustrations take center stage and kids pour over the pages, remarking on the pictures and learning almost effortlessly. 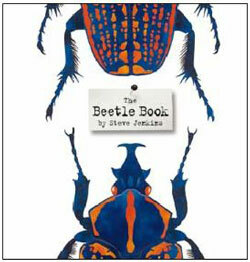 The Beetle Book is Jenkins' newest work and a remarkable one at that. The book has received four starred reviews and is one of the New York Times Best Illustrated books of 2012. The Beetle Book starts out with a compelling introduction, "Line up every kind of plant and animal on Earth and one of every four will be a beetle." With so many beetles in the world, it's a wonder that Jenkins was able to pare down the facts into one 40-page picture book. Yet he manages to provide a kid-friendly overview of the Beetle family as well as briefly highlighting many, many beetles (over 75 different beetles, in fact), some familiar, some unusual. And, the illustrations are simply magnificent! The book is organized not by beetle species but rather by beetle characteristics. Early in the book Jenkins includes a large diagram labeled with beetle parts. There's also a very small section about the life cycle, and separate segments about food, sounds, senses, movement and size, dispersed among the illustrations along with other topics such as chemical defense and clever disguises. Though many of the beetle illustrations are larger than life, black insect silhouettes found along the edges of the pages are actual size. Kids will enjoy learning lots of strange and unusual facts about different kinds of beetles from this book and, after reading, should be able to remark on the common traits of beetles. My 2nd grader was especially intrigued by the image of the burying beetle covering a dead bird so its larvae will have food. She also really liked the large head shot of the six-spotted green tiger beetle. After looking at the illustration she noticed for the first time that many beetles have antennae beneath or next to their eyes, not above. Because Jenkins treats the text almost like captions supporting the illustrations, most readers probably won't read the book in its entirety from cover to cover but instead peruse slowly, reading by choice factual snippets that individually entice. The book leans more toward educational entertainment rather than a hard-core research book useful for writing reports. Though Jenkins includes a useful index of beetles in the book listed by page, a topical index is not included nor are recommended resources for further beetle research. However, the only real criticism I have of the book is that Jenkins, in the beginning, glosses over the main anatomy of insects, only briefly mentioning that beetles have three main body parts like all insects, but never specifically stating what those important parts are (though he shows those parts mixed with other "beetle bits" on his diagram). I wish he had better distinguished these parts (head, thorax and abdomen) from the other parts on his diagram as this book has the potential to be a useful teaching tool for early and middle elementary educators. 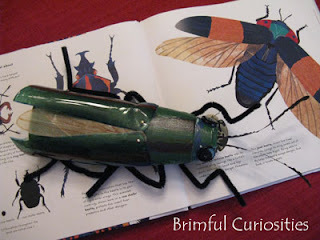 Jewel Beetle model displayed next to Steve Jenkins' illustrations. Last month my daughter's teacher sent home an assignment involving insects. Prior to the assignment, the class learned about insects, with a focus on the three main body parts: head, thorax and abdomen. They even learned a special Head, Thorax, and Abdomen song. 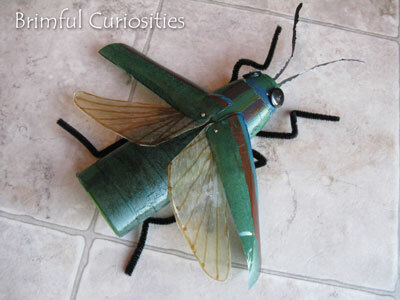 The teacher asked the kids to create their own insect model out of recycled materials. 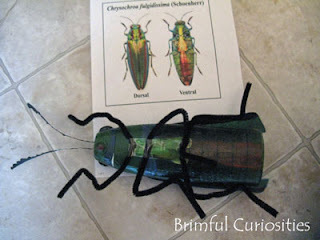 My daughter searched through Jenkins' The Beetle Book and also looked at another detailed insect book we have at home, Simon & Schuster Children's Guide to Insects and Spiders and decided to make a jewel beetle. There are over 15,000 jewel beetles in the world so she further narrowed down the type by picking a special beetle called the Japanese Jewel Beetle (Chrysochroa fulgidissima). She was able to find detailed information about this specific beetle in Workman Publishing Company's Bugs Fandex (Fandex Family Field Guides) and also on Wikipedia. She constructed her bug model using an empty shampoo bottle as the base. 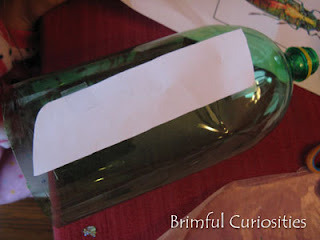 She covered the bottle with green tissue paper using Mod Podge. Using acrylic paint, she added details to her beetle and she painted the head green. 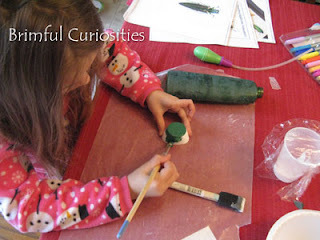 The hard wing casings are cut from a plastic liter pop bottle and she made the delicate wings out of wax paper and packing tape. The eyes are old buttons hot-glued on to the head and she cut the antennae out of black paper. She used pipe cleaners to construct the six legs. Bottom view of jewel beetle model. My insect model is a Japanese Jewel Beetle. It has colorful, shimmering wings and grows about 1.5 inches long. This Jewel Beetle lives in forests in Japan and is a wood-boring beetle. The larvae chew tunnels in the wood of trees and sometimes destroy the trees. There are over 15,000 different kinds of Jewel Beetles in the world. The model took nearly an entire Saturday to make. The neatest parts of her model are the wings and wing casings. She attached the wings and wing casings to the model with brads and the wings can spread out to fly or fold in just like a real beetle's wings. Did you know that some people use the beautiful, iridescent wing covers to make jewelry and decorate clothing and other things? Hence the name, I suppose! You final product is amazing! What creative gift you have! Thank you for sharing this on Read.Explore.Learn. I will be sharing this on the Facebook page. That is a wonderful model. I love it! Thanks for committing on my page. I hopped over to check you out and had to follow! That is a gorgeous beetle! I'm saving this for next time we study flying creatures or learn about beetles. Very impressive! I am so happy though that I don't see a lot of beetles where we live. Not a big fan!